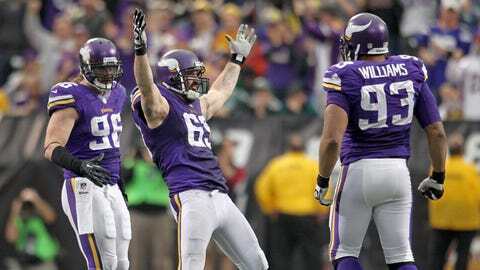 Defensive linemen Jared Allen (middle) and Kevin Williams (right), two players that spoke Saturday night during a team meeting, celebrate Allen's second sack of the game against the Eagles. EDEN PRAIRIE, Minn. — The playoffs were no longer a possibility. The Minnesota Vikings were looking at the second-to-last home game in the Metrodome on Sunday without the incentive of the postseason. They were playing without the top two running backs in the team’s run-first offense and the top three cornerbacks on a defense that is on pace to allow a team-record for points in a season. They met on Saturday night at the team hotel and several veteran players spoke up, addressing the team on why there were still reasons to fight, to not give in during a lost season. Coach Leslie Frazier said several players stepped forward, naming John Sullivan, Phil Loadholt, Kevin Williams, Jared Allen and even Matt Cassel, in his first year with Minnesota. "This is Saturday night, to win this game and why that game was important to the people in that room," Frazier said Monday. "And it was a very emotional time and then to see them come out and play the way they did with the odds so stacked against them makes you very, very proud of every one of those guys in the locker room. No matter what happens at the end of this season or the future, they have my respect." The playoffs had been all but officially out of the question since the Vikings’ lost seven of their first eight games. Players and coaches were left to wonder about their future after this season. Reports had already begun to spring up about the status of Frazier, with a second disappointing season in three years as Minnesota’s head coach. Only the Vikings (4-9-1) didn’t continue to slide. They remained competitive. Sunday’s 48-30 win against the Philadelphia Eagles, which had won five straight games to take the lead in the NFC East, demonstrated the fight left in Minnesota’s players and coaches. "When I talked with them after the game, we were in the locker room, I told them how proud I am about the way they have continued to compete," Frazier said. "They come out here and they practice hard every time that we get on the field. They don’t get caught up in the what-ifs and what could have been. They work as hard as they can to focus on that opponent." Handling distractions and staying focused on the task at hand might be Frazier’s greatest strength as coach. His first season was marked by the lockout, a franchise-worst-tying 3-13 record and a scary knee injury to Adrian Peterson. As interim coach, he brought the Vikings through the tumultuous end to the 2010 season, with the collapse of the Metrodome roof, playing a home game in Detroit and being forced to play on a Tuesday in Philadelphia. This season, there were the seven losses in the first eight games, the blown leads in the final minute — five times in all — more off-field issues and several key injuries. Yet, Minnesota is 3-2-1 in the second half of the season. Vikings’ players spoke of the resilience following Sunday’s win. "I think that this locker room, more so than any other team I have been on that has been struggling, they have stuck together," Cassel said after throwing for 382 yards in Sunday’s win. "The attitude has been great. They have great camaraderie. We have good leadership. So, as you can tell, nobody is laying down for anything. We are still playing for something. We are going to go and try to end this season on a high note with three wins." The leadership Cassel spoke of made its presence felt Saturday night. "We know we’re not playing after Dec. 29 (the regular-season’s final game at home against Detroit)," guard Charlie Johnson said Monday of Saturday’s message. "But put on tape, whether it be here next year or somewhere else, put on tape that you’re not a guy that’s going to quit. I think that helps with some of the younger guys who come in and haven’t necessarily experienced this. They’re veterans that have gotten where they are because they play every week, every game, regardless of the situation." Allen was one of the players who stepped forward. He then had two sacks on Sunday. "I think they do a good job of getting self-motivated people here," Allen said after Sundays’ win. "Obviously, wins and losses, you want to win. You want to play meaningful football. When you’ve got guys fighting in December when you know you’re not going to the playoffs, that’s a good sign of the character of your football team." Like Frazier, Allen’s status is uncertain. He’s in the final year of his contract. Frazier has one more season remaining, but reports have surfaced about the Vikings looking for a new coach after this season. Meanwhile, Frazier has his supporters in the locker room and the recent play demonstrates a united team. "He hasn’t quit on us," Johnson said. "We haven’t quit on this season. He did a good job of conveying to everybody that we still have a lot to play for, regardless of our record, and that resonates amongst this locker room. I think it just speaks to who he is and what kind of person he is that he’s not giving up on the season. So why should we?" Frazier has kept his team from falling apart in a season that has slipped away from expectations after a playoff run last year. The players find their motivation from each other and their beleaguered coach. "It says a lot about the people in this locker room and our coaching staff and our front office that we’re not going to give up," Johnson said. "We’re going to go out and play. Obviously this is our job, but a lot of times guys can dial it in, but not here. Our veteran leadership in this locker room won’t let that happen, and Coach Frazier won’t let it happen."